Bosch makes arguably the best dishwashers in the world. A Bosch dishwasher is quiet and energy efficient. In this article, we would like to draw attention to one of the strong suits of Bosch which is its vast selection. Unlike its competitors, Bosch offers different dishwasher product lines to address the unique needs of its customers. While achieving this goal, Bosch does not compromise their legendary German quality standards. Many of our customers ask us what distinguishes one Bosch model from the other? Below, we explain in plain English (hopefully without industry jargon) how you can easily select which model family might be best suited for your needs. PRO TIP - Make sure to contact our staff at (888) 714-4938 to inquire about savings on Bosch dishwashers. This is the enty level Bosch product family with prices ranging from $500 to low $600's. This line was formally known as the Ascenta series until late 2018. The SHX84AYD5N is the go-to model on this series at 48 dB. People are generally happy with drying performance of these dishwashers as long as they use proper rinse aid and load the machine correctly. The SHEM63W55N is the most popular Bosch dishwasher under $750. Its price floats around $699 including the manufacturer rebate. 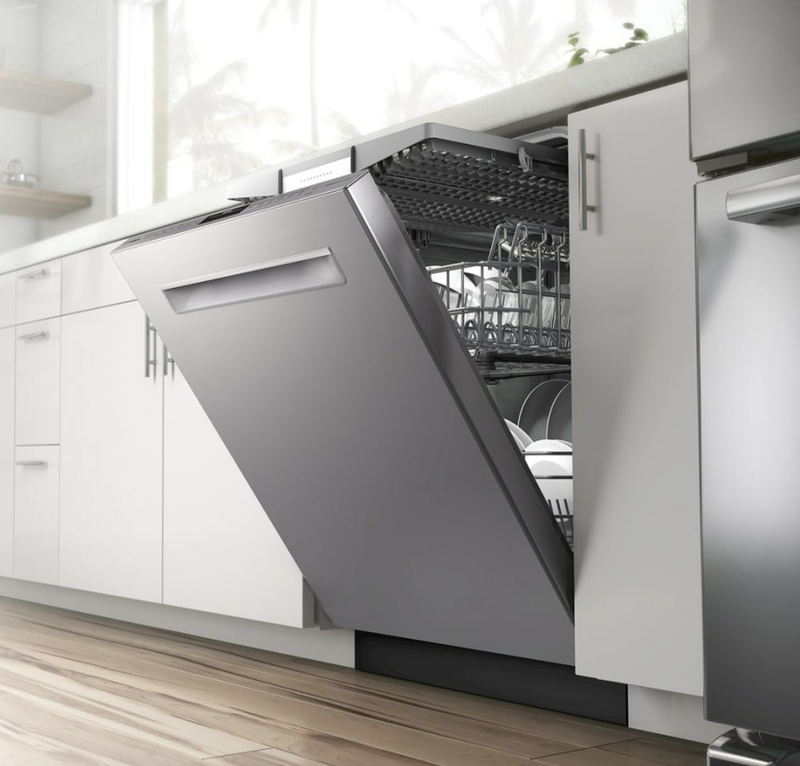 Bosch 300 series comes with a variety of design choices as well as with models suited for special applications such as ADA height for raised floors, watersoftener and 18" slim dishwashers for smaller kitchens. Bosch 500 Series SHP865WD5N dishwasher is a true hit for the manufacturer. It features the timeless pocket handle design which fits any kitchen environment. After seasonal rebates you will be able to purchase this model series for as low as approximately $700. Bosch added EasyGlide racks as the premium feature to the 500 Series. You will get to appreciate EasyGlide when pullin in/out the fully loaded upper rack with ease. As of 2019, Bosch included a new bar handle version for the 500 series. The 800 Series dishwashers are the flagship design for Bosch. You will notice the instant upgraded look and feel on these dishwashers similar to entering in a luxury German car. Considering seasonally available rebates these dishwashers start at mid $700's price point. The SHXM78W55N stands out in this series as the most popular choice among our customers. MyWay Rack is introduced with the 800 Series. This special 3rd rack application is ideal for ramekins, cereal bowls, measuring cups, ladles and more. You can even find a removable silverware tray with folding tines on this innovative 3rd rack. HomeConnect feature gets you Internet connectivity. If you cannot get enough of your iPhone, HomeConnect will give you one more reason to spend more time on it. Similar to the 300 Series, the Bosch 800 Series dishwashers come with a variety of design choices as well as with models suited for special applications such as ADA height for raised floors, watersoftener and 18" slim dishwashers for smaller kitchens. This series of dishwashers are ideal for those who are seeking the best cleaning performance along with the quietes possible operation (impressive spectrum from 38 to 42 dB). Bosch Benchmark dishwashers also come with all the bells and whistles such as interior lights and easy gliding racks. The SHV89PW73N stands out as a shallow depth dishwasher with customer panel ready finish so you can integrate it with your cabinets. Bosch offers different dishwasher styles and a rich feature set to fit any budget. While the Ascenta and the 300 Series dishwashers are ideal for those who are budget conscious, the 500 Series and especially the Bosch 800 Series dishwashers will give you the maximum quality and design choices. Also, Bosch has many options for special applications such as shorter height units, water softener for hard water areas and 18" slim units. At Designer Appliances we keep close track of changes and updates to Bosch dishwasher product catalog. Feel free to check the latest updates in our blog post "What’s New in Bosch Dishwashers"